Covering #s 8,9, and 10. Three suttas which describe a stepwise method of progression from faith to arahantship. Each slightly different. Since each purports to be a path to Arahantship an equivalence is implied. Your homework is to see if you can see the equivalence. Another challenge is to rationalize the fact that here one sacred cow is left out, there another. For example the Eightfold Path is omitted in all but one of these methods, the jhānas are included in only one. The trick is to let go of any tendency to hang on unyieldingly to terminology while simultaneously being so precise in one's thinking that nothing essential to the process is missing. The term to understand here is 'appamāda': A = non; PAMĀDA = carelessness. One of the most frequently occuring concepts in the whole of the Pali Cannon. This word is a mantra. A magical word which if concentrated upon, repeatedly pronounced to the point where it induces a hypnotic trance, opens up to reveal the memory embedded in it's creation. A memory which goes far beyond the admittedly valuable idea of being cautious. A list (in some detail) of ten ways in which the Aristocrat (here equal to the Arahant) abides. There is a strange order of terms here and in the previous sutta, maybe a mistake. Not very important. In the beginning and end both suttas have 'abided, abides, and will abide', (āvasiṃsu, āvasanti, āvasissanti) but just before the end in this sutta is the standard order: 'in the past abided, in the future will abide, and in the present abides'. In an alternate version of the Great 10 Questions, the Kajaŋgala bhikkhunī expands the questions given in brief to a group of lay followers. Her version contains a few answers that differ from those given in the previous sutta [AN 10 27]. This is the set of ten questions on which much of The Pali Line (the introductory course in the Buddhism of the Pali Suttas recommended here) is based. These ten questions can be used in much the same way as the kasina, or concentration device, as a 'theme' of practice. In each individual case it is explicitly stated that thorough comprehension leads to 'the end of dukkha' or Arahantship. The actual experience is that one sees how each of these is of such a nature as to encompass all the rest ... and all the other doctrines of the system. Raja Pasenadi pays a visit to the Buddha and shows great respect and enumerates the reasons for his great respect. Woodward notes that this sutta contains statements that would not likely have been known to Raja Pasenadi. This seems an obvious case of tampering by early compilers. Compare this sutta with MN 89 Horner (the much more likely true story). The issue for us is: does it matter? As far as the doctrines contained in the sutta they have no inconsistency with their counterparts in the rest of the suttas (they are in fact mostly verbatim pick-ups). It is distasteful to our sensabilities that the editors should make an explicit claim that this was a true sutta when the fact is insupportable, but the reality is that story telling tradition has always been very liberal in such matters ... right on up to today. In any case, what we should not do is 'throw the baby out with the bath water' and disregard the Dhamma within the sutta as not-dhamma because of a liberty taken by an editor. Upāli asks the Buddha about the reasons for establishing the Patimokkha (the rules of the Order) and about the various reasons for it's suspension. The Buddha tells Upali of the ten things that are taken into consideration before he formulates a rule for the order. Bhk. Bodhi has the second part of this sutta incorporated into the next sutta. Upāli asks the Buddha about the reasons quarrels arise in the Order. Upāli asks the Buddha about the roots of quarrels. Mahāli asks the Buddha about the reasons for bad and good deeds. In a very interesting post-script to the direct answer that it is is as a consequence of lust, hatred, delusion, not noticing the beginnings of things, and following wrong views and the reverse of these five, he further states that without these ten things there would be no wrong or deviant living or right or straight living. In other words these things amount to the sum total of what is needed to be done in the system to attain it's goals. No mention of the Magga. In other other words, the Magga is a method for eliminating the first five of these things, so instruction can be given in these two general ways: either by stating the things to be eliminated or by stating the method to eliminate them. The choice, presumably being made based on the listener's inclination and capabilities. Once a request was made for an instruction in brief where the response simply stated: "Whatsoever has to do with hunger (taṇhā), know that is not Dhamma." BD: Ten Things, Olds, trans. The Buddha reveals ten perceptions which are very helpful to seekers. I did a translation of this sutta so that we would have here a contrast with Woodward's translation. There is an enormous difference when 'sannā' is translated 'perception' rather than 'idea'. Sannā = 'one-knowing' or 'first-knowing' or 'once-knowing' = perception, not idea. The difference is that an idea is an abstract thing, tending to suggest an intellectual understanding apart from the perception of it being something connected to the self (speaking conventionally, or, rather, since these things are 'helps along the way', speaking with regard to the identification with 'this being'); here the idea is to have actually seen these things as they manifest themselves to one's self... actually seeing, or smelling, or tasting the identical repulsion one has of excrementia, in some otherwise delightful food for example, or the actual feeling of world-wearyness when some ambition arises, or the conscious recognition of release (a deep sigh of relief that feels like it is the first full breath one has had in a long time ... which it is) when one has finally passed the withdrawl stage connected with some habitual practice one has let go. The Buddha teaches ten important ideas by posing them as questions that might be asked of Buddhists by outsiders. There is an interesting manipulation of the term 'dhamma' here which illustates it's dual meaning as 'thing' and 'Form' (in the sense of 'Good Form') or 'The Teaching.' This translation of 'Dhamma' as 'Good Form' comes from the discussion of the term in Rhys David's Buddhist India pg 292 where he points to the etymological root as "identical with the Latin forma" our 'form'. This serves very well for this word where it must stand for 'thing' and is a synonym for 'rūpa' (often translated 'form') in this sense, and also for 'the best way to do a thing', or 'Good Form'. This use for 'form' is found in asian cultures where the idea is exactly that there is a perfectly correct and efficient way to do even the smallest things. The expression 'Doing Forms' is also used as the English translation for the term in asian martial arts that stands for various groups of moves in practice routines. At this time the word 'Dhamma' for Gotama's teaching is relatively well known here and it will probably stick, but there is confusion that results when the word must be used for 'things' and ... 'Good form' in general. In the technique of the Paṭicca Samuppada, the Buddha traces out how blindness rolls on and the way freedom from it is managed. The distinction in the terms used here from those used in the Paticca Samuppada should be enlightening. The term for the relationship between a thing and it's result is 'food'. This is the food of that. The significant difference between the idea of 'food' and the idea of 'cause' should be kept in mind when thinking about the meaning of this sutta and the translation of terms such as 'paccaya'. ATI: Ignorance, Bhk. Thanissaro, trans. Together these bracket the first condition of the Paṭicca Samuppada: Avijjā paccayo saŋkhārā. [see for example SN2.12.001] Blindness (Woodward's 'Ignorance') results in own-making. On one side it answers the question: 'then what is it that results in blindness?' And on the other side it answers the question as to why blindness results in own-making. Another thing is that since 'taṇhā,' thirst, (Woodward's 'craving'), results in the usual first condition of the paṭicca samuppada, 'blindness', and is also a 'condition' following sense experience within the formula, we can see by this that the paṭicca samuppada is to be taken as a series of what Bhk. Thanissaro has called 'feedback loops' and should not be taken exclusively as a direct-line analysis. 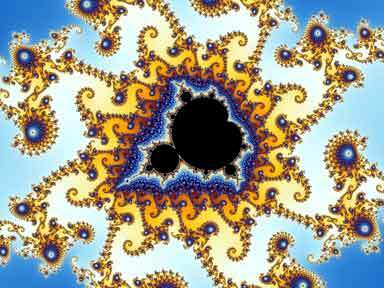 An interesting comparison could be made to the Mandelbrot Set, where, at any point along a series a new series could be begun, and so on without end. BD: Taking A Stand, Olds, trans. BD: A Satisfying Certainty, Olds, trans. On proper topics of talk. Note that included in the topics of talk called 'animal talk' which should be avoided is talk about existence and non-exisetence of things. This includes 'self' — the discussion of whether or not there is a self, the statement that 'There is no self', are not proper subjects for discussion. The topic suitable for discussion is that there is 'no thing there that is the self'. The former is an opinion, the latter is something that can be observed. ATI/DTO: Thorns, Bhk. Thanissaro, trans. Directed at laymen, the Buddha describes ten things which one should make an effort to grow and which should be considered as consistent with progress on the Way. Migasālā confronts Ānanda in a huff because of her confusion over the fates of her father and uncle. Both were declared to have been reborn in the Tusita realm as Once-returners by the Buddha. Her father was proficient in ethical conduct but deficient in wisdom, her uncle proficient in wisdom but deficient in ethical behavior, but Migasala only sees one side: that her father was proficient in ethical behavior and her uncle was not; and she proceds to judge the Buddha and the Dhamma as flawed. Gotama explains the issue to Ananda and gives five similar cases. Another version of the sutta is at AN 6.44. The Buddha suggests ten thoughts as counter-weights to the arising of anger possible from ten situations where anger might arise (those of the previous sutta). Our version of the BJT Pali was incomplete for this and the previous sutta. This may have been corrected, but readers of that version should check. Woodward and Bhks. Thanissaro and Bodhi have trouble with the phrase: taṃ kut'ettha labbhā' ti? 'What is to be gained from that?' The meaning is understood if kamma is kept in mind. The idea is to calm one's tendency to an angry reaction by remembering that this deed this fellow does will return to him and that therefore there is no need to seek vengence from a feeling of outrage at injustice. Maha Moggallāna describes the examination that will be given to one who declares arahantship by those who are arahants, skilled in the jhanas and able to read the state of and habits of the hearts of others. Possessing any of ten characteristics he will come to an impass and ruin when questioned. But if one abandons all these ten characteristics he may come to increase, growth and maturity in this dhamma-discipline. Cunda the Great puts his spin on the previous sutta. In this case a boaster brags of attainments and is questioned by one skilled in the jhānas and able to read the state of and habits of the hearts of others. Possessing any of ten characteristics he will come to an impass and ruin when questioned. But if one abandons all these ten characteristics he may come to increase, growth and maturity in this dhamma-discipline. Kassapa the Great puts his spin on the theme of the prevous two suttas. Maha Kassapa deals with the case of a bhikkhu who, due to confusion of mind created by great learning, thinks he has attained arahantship. He is questioned by one skilled in the jhānas and able to read the state of and habits of the hearts of others. Possessing any of ten characteristics he will come to an impass and ruin when questioned. But if one abandons all these ten characteristics he may come to increase, growth and maturity in this dhamma-discipline. The ten characteristics in each of these cases is slightly different. Each of these versions reflects the character and special interests of the speaker. A well-known sutta describing the horrific result of hardening his heart against Sāriputta and Moggallāna by the Kokālikan Monk. This sutta has in it the mention of a 'paccekabrahmā.' Bhk. Bodhi, in a footnote, cites Spk-pṭ I 213 (VRI ed) commenting on SN I 146, as explaining this as "a brahmā who travels about alone, not as a member of an assembly". This possibly throws some light on the term 'pacceka-buddha' which is usually translated 'silent-buddha' or as Woodward has translated it here for the brahmā, 'Individual-'. This term, when applied to a Buddha, means an individual who attained Arahantship without the aid of another awakened individual but who has not the training or charisma or inclination or opportunity to lead a following. There is also here another visit to Gotama by Brahmā Sahampati. Gotama speaks to the wealthy banker Anāthapiṇḍika, breaking down the distinctions between sorts of persons who are still enjoyers of sense pleasures according to the extent they earn their wealth legitimately and dispense with it wisely. Gotama explains to Anāthapiṇḍika how one may know with certainty that one is a Streamwinner and that one has passed beyond the reach of certain unpleasant forms of rebirth and is assured of eventual awakening. The careful reader can see in this sutta how development of ethical behavior leads to unwavering faith in the Buddha, Dhamma and the Saŋgha which leads to insight into the method. The term translated 'Guilty Dread' by woodward and 'fear and animosity' by Bhk. Thanissaro and 'perils and emnities' by Bhk. Bodhi is bhayāni verāni. bhayāni = fear, fright, dread; verāni = hatred, revenge, hostile action. A possible better translation is 'fear of retribution', which is what makes up guilty dread and is the peril of emnity and the fear of animosity. These actions are perils and do produce emnities and fear and animosity both in the doer and in others, but the issue in this sutta is a condition for knowing that one is a streamwinner and that condition is the absense of or allaying of bhayāni verāni. within. It has nothing to do with what may result externally from these actions. This is a good sutta to contrast with AN 10.64 where faith alone is being spoken of as a condition for stream-entry. It should be noted here that in both cases there is no mention of breaking the saŋyojana. That is not to say they are not broken, but only to point out that the formal terminology is not used and because of that there is the possibility of flexible understanding of the conditions. Possessing the four limbs of Stream-winning would be the breaking of doubt and wavering (vicikiccha); true insight into 'the method' would be the breaking of the 'one truth view' (sakkāyadiṭṭhi (usually translated in terms meaning 'own-self-view': 'Person-pack-view' 'views on individuality' etc., my translation, points to the idea that it is getting rid of holding any view concerning the existence of anything that is the necessary meaning in that holding on to a view concerning the existence of anything is a projection of the idea of self, but perhaps that is going farther than is necessary, or even confusing the issue) and attachment to the view that the goal was reachable through giving, ethical conduct, or rituals (sīlabbataparāmāso). One can imagine (or experience) a situation where one or some or all of these conditions are only partially met here, but where with faith in the Dhamma, or in the idea that Gotama achieved Awakening, or in the idea that there were those who had advanced towards the goal, upon death or upon the subsequent rebirth they come to fulfillment. That person would by that faith and partial accomplishment reasonably be called a stream-winner. On the other hand, that person would not be able to state with absolute conviction, that he was a stream-winner. Hopefully reflecting on this sutta would, in that case, inspire greater effort. Anāthapiṇḍika visits wanderers of other views, listens to their views and shows the wanderers how, in each case, the view is just a grasping after security based on something theoretical, made up, and which will lead to pain. When asked about his own views he responds that it is a not-clinging to things that are graspings after security based on things theoretical, made up, and which will lead to pain. This sutta amounts to a statement by Anāthapiṇḍika that he was at this time a stream-winner who 'knew and saw', one who had the Dhamma-eye: That all things that have come to be come to an end. After his death he was pronounced a Non-returner by Gotama. Vajjiyamāhita visits wanderers of other views and corrects their understanding of Gotama's position on austerities pointing out that he teaches discriminating between the profitable and the unprofitable. Vajjiyamāhita reports back to Gotama and the Buddha elaborates this position in terms of austerities, trainings, making effort, letting go, and freedom. Vajjiyamāhita is one of 20 other laymen said to have achieved 'realization of the deathless' in AN 6.147. Upāli has got it into his head that he wants to become a forest-dwelling bhikkhu. The Buddha, apparently perceiving disaster for him in this course, in that those without mastery of serenity (as was the case with Upāli,) are highly vulnerable, living in the forest, to either failure due to unskillful states of mind or to just not making any headway at all, discourages him with a long discourse on what actually needs to be accomplished in this system to achieve the goal. Upāli, by the way, follows the Buddha's advice and remains dwelling with the sangha and becomes one of the foremost bhikkhus in the understanding of the Vinaya, or rules of the order. When three things about the reality of his situation as a bhikkhu are perceived it results in the fulfillment of seven highly advantageous conditions in his life. BD: A Seeker's Perceptions, Olds, trans. The Buddha explains how the low road leads to failure and the high road leads to success. The exposition of the two paths is in a paticca-samuppada-like formula: 'this being that becomes'; and consists of the positive and negative dimensions of the Seeker's Path, the Eightfold path with the two additional dimensions of knowledge and release. No mention is made of the Eightfold Path or the Seeker's Path. Woodward translates 'sammā' and 'micchā' as right and wrong, which would be better as 'high' and 'low', or 'consummate' and 'contrary'. For discussion of these terms see: On "Sammā" "Miccha," "Ariya," and "Angika"
BD: The Low, M. Olds, trans. The Buddha explains in a paticca-samuppada-like style how blindness (a-vijjā) leads to shameful behavior and that gives rise to mistaken points of view which leads to false release. Where there is vision (vijjā; 'seeing' the bad consequences of shameful acts) gives rise to consummate point of view which leads to consummate release. Ajita approaches the Buddha and describes what he understands to be a sage. Gotama responds by describing that a sage in this sytem is to be understood as one who argues according to dhamma. Gotama then enumerates ten general areas to be considered good form and which are the goal and ten which are not good form and which are not the goal. An expansion on the previous suttas. There is a big problem with this sutta. No single version of the Pali or translation agrees with anything else. I have provided links for many of these suttas to the Rhys Davids translation of the Mahā Satipaṭṭhāna Sutta definitions for the first eight terms and to The Method for the last two terms. The Buddha defines a path which heaps up rebirth and a path that is beyond heaping up rebirth. PED has 'apacaya' as 'unmaking' or 'diminishing' which is also the way Woodward (diminishing) and Bhk. Bodhi (dismantling) translate. PED forms the word from 'apa + ci" 'up passed-whatever.' A simpler reading would be that the root is 'caya' 'heap' and the prefixes are 'ā' 'to' and 'apa' 'up-passed.' The importance is in whether or not what is being said is that the path dismantles the existing pile of future rebirths, or does not create any new future rebirths. It works both ways. The Buddha defines a path which ripens in pain and a path that ripens in pleasure. Woodward following PED translates 'vipāka' 'ripening', as 'fruit' meaning 'fruition'. Since 'phala' which is 'fruit' is often used in the suttas the better translation would be the literal 'ripening' or 'fruition' or along the lines of 'consequence' 'result', etc. Āsevi 'to revisit'. The Buddha defines Dhamma that should be pursued and that which should not be pursued. The Buddha answers Brahmin Sangaravo's inquiry about what is the hither shore and what is the further shore. Similar to AN 10.117 with a different explanation. Suggested theory about this sort of sutta: (that is a sutta in which some individual asks a question and gets an answer and then at another point asks the same question and gets a different answer — or, as with the following sutta, where an explanation of some point is made in one way at one time and in another way at another time). It happens frequently. The hypothesis is that it was a sort of game played by Gotama, possibly also by the questioner. Could the listener figure out that the two different responses were equivalants (or would he think Gotama was inconsistent? ); could Gotama remember his previous response; could he come up with a variation that was an equivalant to the previous answer; how was it equivalent. Whether this hypothesis is correct or not it makes a good exercise in ones comprehension to try to see the equivalence. The Buddha explains that it is a consequence of acting upon lust, hatred and stupidity that there is killing, theft, sexual misconduct, lies, spite, bitter speech, idle babble, coveting ones neighbours goods, working harm and wrong view, and that to bring these things to an end it is necessary to end the intentional action (kamma) bound up in lust, hate and stupidity that brings them into being. BD: Bound-Up in Intentional=Action, Olds, trans.